The PODCAM360 Frozen Moment Movie Booth is now being marketed with targeted Email updates in addition to the branded Capabilities Deck produced by Luxtone Media. Jim Colao provided layout, modified photos, and worked on copy to meet the requirements of Xerox Corporation, Cirque du Soleil, and Big Freeze Worldwide. After Luxtone Media developed a totally new website for The CANDY STORE, an email announcement was created that also summarized the company's 3 main strengths. 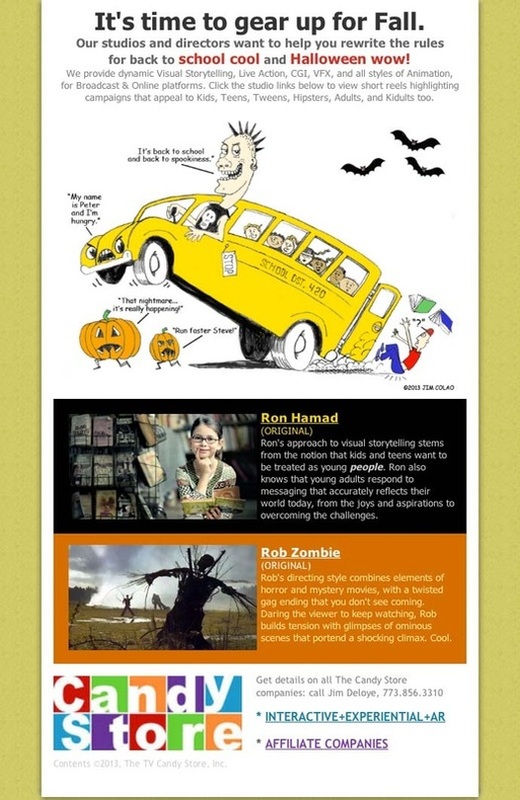 The main image was created to quickly express the idea that the new site was viewer-friendly on all devices and monitors. This concept reinforces the sales pitch that states The Candy Store's companies produce content for "all screen sizes." 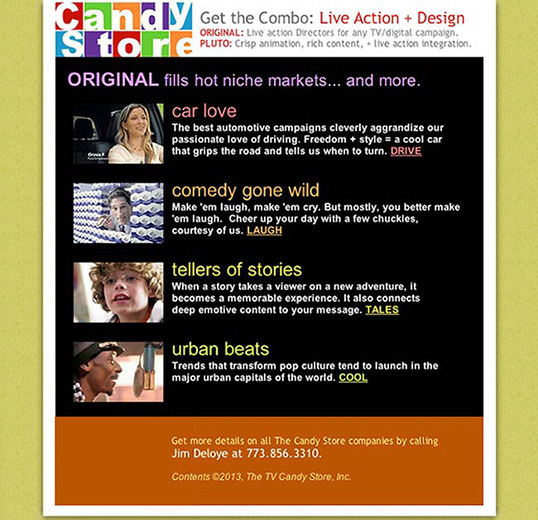 ﻿The TV CANDY STORE injects all its bulk email branding with humor and high contrast color distinctions. When new Directors or Studios are added to the roster, or during seasonal peaks, a new email page is designed. Thematic flow and copy development are a joint effort between the Exec. Producer and Jim Colao.